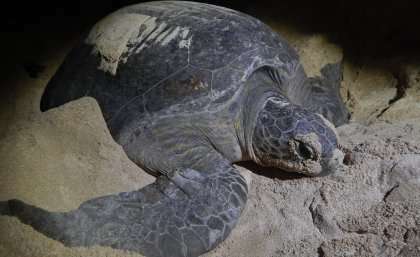 A study has revealed the diet of green turtles is more complex than previously thought, providing insights which could influence conservation and management strategies. University of Queensland PhD student Owen Coffee said mature green turtles continued to snack on jellyfish and small invertebrates, and did not switch solely to a plant-based diet. "It was thought they went from being carnivores after their juvenile development period in the south Pacific open ocean," Mr Coffee said. "This study has revealed their longer-term diets reflect the availability of food. "A large proportion of the turtles sampled had supplemented plant material with animal material, likely jellyfish and ctenophores, when they were available." Mr Coffee said green turtles spent between six and 10 years at sea before arriving at near-shore foraging regions. "They remain at these sites for the rest of their lives, leaving only intermittently to mate once they reach sexual maturity." The study, coinciding with World Turtle Day (23 May), examined diets of foraging green turtles at three sites at Port Curtis in Central Queensland. The sites included discrete 'home' areas in reef habitats and sandy seagrass meadows. The researchers studied the gullet contents of the animals before safely releasing them. Turtles were recorded eating 30 different food items, categorised as mangrove, seagrass, red algae, brown algae, green algae, animal material or other items incidentally ingested.